April 9, 2019 -- You've already seen a lot of pictures from this day but I saved this picture of my overly dead tulips just for this photo project! April 10, 2019 -- I thought I hadn't taken any pictures this day but thankfully we cooked a meal for our Country of the Week project and I always make sure I document those. This day it was cabbage rolls from Lithuania. April 11, 2019 -- After a really busy week all I wanted was to be on vacation. Drinking coffee-hot chocolate out of my Disney Cruise mug reminded me of relaxation. April 12, 2019 -- The kids had a PD day. After having play dates in the morning, they enjoyed a relaxing afternoon of colouring and reading. 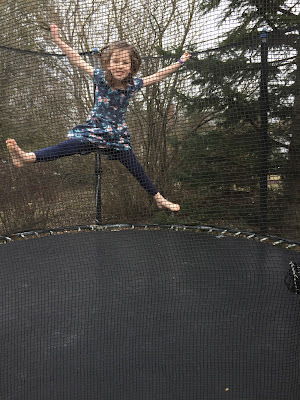 April 13, 2019 -- Rachel and Dave enjoyed some trampoline time. Our glorious spring days are few and far between right now but we wring all the outside joy out of them that we can. I hung out four loads of laundry which was my version of "wringing out the joy." Ha! April 14, 2019 -- Yellow tulips on a grey rainy day. April 15, 2019 -- The bench for holding my laundry baskets has been added to the backyard. And I think it's getting greener. Maybe? April 2, 2019 -- If you look closely at this picture you will see the lunch container is labeled "Rachel" on the lid and "Sam" on the container itself. So who was supposed to take this for lunch?!?!?! April 3, 2019 -- My intended Readathon TBR. April 4, 2019 -- After an incredibly busy day I was so grateful to crawl into bed with a good book and some lemonade. April 5, 2019 -- Our church hosted an event called "Beyond Binaries: Creating an Affirming Church." It was the impetus of, and mostly organized by, a Grade 12 youth in our church who I have known since they were born. I spent quite a few hours volunteering in the kitchen this day and Sam and Rachel rolled all this cutlery into these colourful napkins. April 6, 2019 -- The worship space for Beyond Binaries was gorgeous. I was so proud of the youth behind this event and all of the work they put into this day. 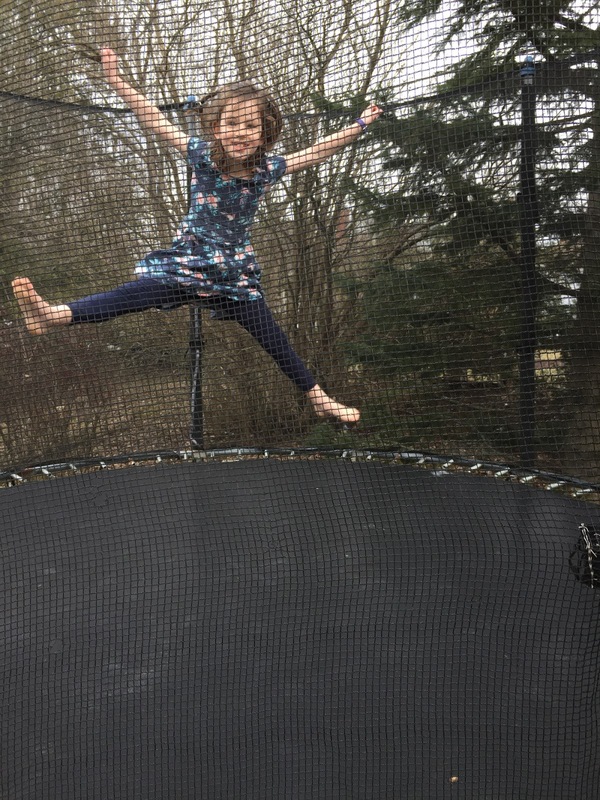 April 7, 2019 -- We set up our trampoline this day. I think Rachel would live out there now if she could! April 8, 2019 -- Last week snow, this week green. Our spring is CRAZY this year! A few days late, here are the goals I want to accomplish in April. 1) Make Bible reading goal a priority. I really DO want to read through my Bible this year. While I'm familiar with most of it, I know there are parts of the Bible I have never read and, even with the familiar things, it's good to read with a fresh perspective. I'm still stuck back in January and I am going to push to get pretty caught up in April. If I'm serious about this goal, I need to make it a priority. 2) Get 10,000 steps a day (preferably outside) on my FitBit. It's the toe beside my pinky toe. What a lovely shade of purple - NOT. 3) Reduce the number of pictures on the iPad. Our iPad is over six years old and has a gazillion pictures on it. Last time I cleaned out the iPad, I wrote this post and I'm sure another one of those is in the making with some of the gems currently taking up space on that thing. 4) Try to give blood again. I got out of the habit of giving blood when we went to Kenya and I couldn't give it for a year. Now I have a friend who depends on a monthly blood transfusion, and even though I can't give my blood directly to them, I can give it to someone else who is in need. 5) Set out weekly clothes for the kids each Sunday. Life goes so much more smoothly when I set out all the kids' clothes for the week every Sunday night. I need to get back into that habit. Laundry in general has gotten chaotic this past month (Read: Sam's run out of jeans (he has seven pairs (all hand me downs)) and both kids have run out of underwear. I don't know why it's gotten so bad...), so this might be one small way of getting a handle on it again. underneath her nightstand. Sam's go on his rocking chair. Our life is so exciting. Ha! 6) Read Bad Feminist by Roxanne Gay and The New Jim Crow by Michelle Alexander. 7) Sort the spice drawer. Here's what it looks like now. Enough said. We have both a spice rack and spice drawer. The spice drawer holds the extra spices and other random things. 8) Get outside and practice biking with the kids -- 20 minutes at least three times a week. The fact that our kids, Sam especially, can't bike yet is starting to hold them back in hanging out with their friends. Rachel is really almost there. We just need to make this a priority and it will be a very good start to Spring if both our kids learn to ride their bikes. Rachel biked a few feet the other day. She is highly motivated to learn. Sam, on the other hand, will be the world's best non-biking baseball player. Ha! You guys always have the best thoughts about my monthly goals so I can't wait to hear what you have to say about these ones! Advice, encouragement, and anything else you have to say is welcome! March 26, 2019 -- Tuesday is dance day! Rachel posed for me in her ballet studio. March 27, 2019 -- I didn't give you any tulip pictures last week but my tulip love is still going strong. March 28, 2019 -- Opening Day of MLB was finally here!!! We couldn't watch the whole game but Sam and I eagerly watched about an hour of it. Here is the first pitch of the year for the Jays!!! March 29, 2019 -- The first laundry hanging day of the year!!! March 30, 2019 -- Sam is TEN!!! March 31, 2019 -- We had a late snowstorm. It was a big fluffy snow and everything looked so pretty.